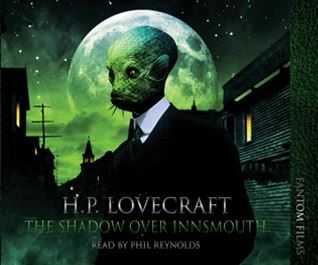 Innsmouth is a dilapidated seaside town with secrets as a hybrid race of half-human and half-amphibian creatures worship the gods of Cthulhu and Dagon… Written in 1931, and published by the Visionary Publishing Company some five years later. This my first ever Lovecraft book and I’m pretty happy with the experience. I wasn’t introduced to the Lovecraft name until high school (which is really late in my case) and by that time I was moving away from books considered ‘classics’ because I’d spent a good 3 years reading almost exclusively that. So I decided on a whim that I needed to correct that and decided to listen to it while at the bookstore. Holy cow this is so creepy! I know the basis of Cthulhu and Dagon, and I’m familiar with all of the other odd creatures but I guess I never realized just how atmospheric and engrossing the stories could be. The town of Innsmouth has a very hard to find visage of normalcy but the people have become some sort of hybrid and they appear to worship creatures from darkness, and the main character is so enthralled with all of it that when he finally realizes just how dark the place is it is almost too late to leave. I love the subtle progression of the main character as he learns more and more about Innsmouth and the people who live there. The more he finds out the more his opinion becomes skewed. I’ve heard that most Lovecraft novels don’t have action in them, but this one does and I loved it! It definitely had my heart racing. There a few issues that I had with this but it’s more on a personal taste level than anything ‘wrong’ with the book. The narrator did a great job with the voices, but he has one of those voices that make me want to sleep. So I did drop off a few times while listening and had to go back. I also had a bit of trouble wrapping my head around some of the prose to begin with, which might be because I was listening to it instead of reading it. I tend to have a harder time understanding things that are read to me than if I just read them myself. If you love horror stories or have been curious about H.P. Lovecraft then I really suggest that you try this out! It’s fairly quickly paced and with Lovecraft’s unique writing style you should have no trouble falling into this one. This entry was posted in Book Reviews (2014) and tagged 3.5 Stars, audiobook, horror, review, sci-fi. Bookmark the permalink. It’s definitely the sort of horror novel I really enjoy, it has that old gothic feel while still being weird enough to make your skin crawl.